There’s a whole boatload of actors I respect. An army of actors I like. Many I love. A few I totally love. And a very small handful that I LOVE. And then there’s Peter O’Toole. An actor of such enormous talent that saying I love him just doesn’t do justice to the man. Certainly I revere him for movies such as “Lawrence of Arabia””Becket””Lord Jim” and “The Ruling Class” but it’s his other, lesser known movies that I really treasure. Such as “The Lion In Winter” which I consider the most quotable movie in film history. Or “The Night of The Generals” or “Goodbye, Mr. Chips” And in the 1980’s he made three movies that I absolutely insist every Peter O’Toole fan see if they consider themselves true fans of his work: “My Favorite Year” “Creator” and THE STUNT MAN. Ask me why I love watching Peter O’Toole and my answer is simple: somehow he makes me believe in characters that can only exist in the movies. The utter theatrically of the way his characters, walk, talk and act is at once blatantly artificial and yet, totally realistic in the context of the circumstances they are in. It’s weird, I know. But that’s the only way I can explain it that makes sense. And there are very few actors who use their voice the way Peter O’Toole uses his. It’s a voice that demands you listen to it because everything its saying has meaning, wit, depth, intelligence and personality. Turns out the driver of the Duesenberg was the stunt man for the star of the movie. Eli only has the location for three more days and he needs to finish his movie. Eli strikes a bargain with Cameron: if he’ll agree to take the place of the stunt man he accidentally killed so that Eli can finish his movie, Eli will hide him from the local police chief (Alex Rocco) and give him safe passage back to California. Cameron is suspicious. Hell, he’s downright paranoid. There’s no way he can pass for the dead stunt man. But he’s underestimated the power of movie magic and thanks to the craft of the makeup department; Cameron is transformed into a near double for the dead stunt man. And since everybody on the set treats him as if he were and even calls him by the dead man’s name, Eli pulls it off. But Cameron’s paranoia kicks into high gear as Eli goads him into doing more and more outrageous and dangerous stunts. Eli plays mind games with him, deliberately challenging Cameron’s sense of his own identity, blurring his personal lines of reality and illusion. And not just with Cameron either. Eli’s God Complex extends to his relationship with the leading lady (Barbara Hershey) the screenwriter Sam (Allan Goorwitz) and the rest of the crew. In fact, the only one who doesn’t appear to be impressed or intimidated by Eli is Chuck (Charles Bail, a real life stuntman) who trains Cameron for the movie’s increasingly wilder stunts. And prepares him for the movie’s final stunt: the one Cameron ruined. Except this time, he’s going to be behind the wheel of the car and he’s going to deliberately drive it into the river. Everybody assures Cameron that he’ll be okay, everything’s fine. Cameron’s not so sure. In fact, due to the extra cameras in the car, Cameron’s positive that Eli means for him to die in the car to get that ‘authentic sense of madness’ he’s wanted in the movie all along. By now, Cameron’s head has been so played with and so has ours that right along with him, we’re not so sure that he isn’t right. THE STUNT MAN has deservedly gained a cult reputation for being a wonderfully directed and acted film and I wholeheartedly agree with that sentiment. Steve Railsback went on to have moderate success as an actor but for me, he never again did anything that comes close to the work he does in this movie. Cameron’s not an easy character to like but we do come to sympathize with his situation. Especially when we see what Eli Cross is like. He’s a bit of a nut. In fact, he may be totally crazy but he’s also dedicated to his vision of his epic. His vision may be a little too much for his cast and crew to get hold of and it’s certainly beyond Cameron’s. But in a strange way, these two men challenge each other in a way I think is meant to be a metaphor for the collaborative creative process of moviemaking. 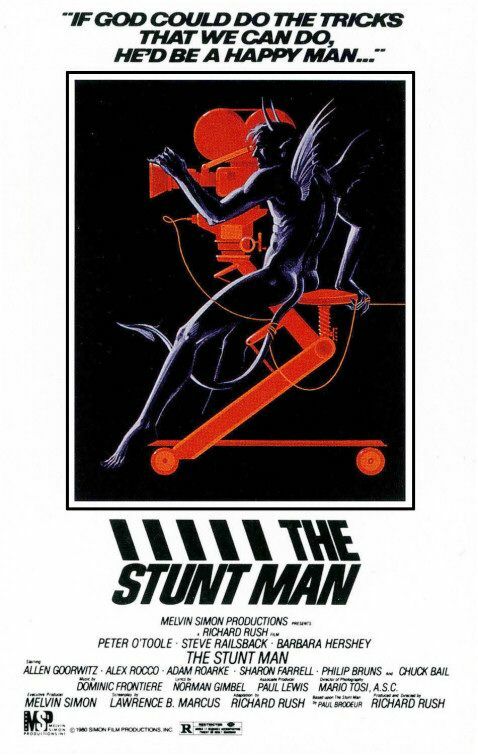 But all that is secondary to the fact that THE STUNT MAN is an entertaining movie that is just a lot of fun to watch. Barbara Hershey is incapable of being anything but beautiful and as far as I’m concerned she’s never turned in a bad performance. Charles Bail gets in a lot of good funny bits such as his lamenting that Eli won’t let him do stunts with horses. And Alex Rocco may have limited screen time but he’s pro enough to know what to do with it that it actually seems as if he’s on screen far longer and far more than he actually is. But it’s Peter O’Toole’s movie all the way. Whether dangling from a director’s crane making up bawdy poetry or raging at a A.D. who makes the mistake of yelling “Cut!” when he shouldn’t have, Eli Cross is a marvelously complex character who is as magic and as magnificent as the movie he’s making. Do yourself a favor and check out THE STUNT MAN. You’ll thank me for it. He killed a Duesenberg? Get the gallows ready! What a great film! And Peter O’Toole is a force of nature. I’ll watch him in anything. Although I haven’t seen Creator in decades, I, too, absolutely love My Favorite Year! Year and Stunt Man were movies I watched over and over again when my family first got a movie channel when cable expanded back in the 80s. In fact, I still quote both of them freely with family and friends. These two films are part of me. I love ’em. Will have to check out Creator again. I remember seeing it in the theater but that’s about it. How O’Toole missed out on Oscars, I’ll never know. Stunt Man and Year should have gotten him the hardware. “Creator” is the movie in which Peter O’Toole plays a biologist/geneticist struggling to clone his dead wife while carrying on a romance with Mariel Hemingway. Both of them play gloriously goofy, eccentric characters you can’t help but love. Look for a review of that soon right here. And yeah, I discovered not only THE STUNT MAN but “My Favorite Year” and “Creator” thanks to 80’s cable which tended to rerun the same movies over and over and over. Peter O’Toole should have won Best Actor for “My Favorite Year” but it’s his curse that he’s always up against someone else who turned in a career making performance. For instance, he was nominated for Best Actor for THE STUNT MAN but that year he was up against Robert DeNiro in “Raging Bull”. Kinda hard to argue against DeNiro deserving to win for that year, isn’t it? I too, love this movie, along with”My Favorite Year”. Could you possibly imagine another actor pulling off either of these way “over-the-top” roles? I had an “up-close-and-personal” moment with O’Toole in 1963. Was in NYC at the Park Sheraton Hotel. Got onto an elevator about 7:00 AM and there he was in a really nasty looking trench coat, barely able to stay upright. Just coming in from an all-nighter no doubt! No sign of Richard Burton or Oliver Reed however.